Tatty Teddy and his beautiful Bride are here to help you invite your nearest and dearest to your big day! Dressed in their wedding outfits and looking as happy-as-can-be, these two loved up cuties will have no problem getting your guests in a pre-wedding flutter! The Tatty Teddy’s cunning square pocket wallet design means it not only holds your wedding invitation, but also keeps your bespoke guest information and RSVP inserts safe in a little inside pocket – perfect if you like everything organised and tickety-boo! Those of you who are avid fans of the Me to You collections will notice that the brand’s font runs throughout this invitation and the rest of the Tatty Teddy wedding stationary range by Paper Themes. Printed onto luxury high white board, the quality of this invitation is evident from the moment you lay your eyes on it! When your guests open their eagerly-awaited invitation they’ll see the loved-up Tatty Teddy twosome canoodling under a shower of coloured confetti. The Bride looks gorgeous in her little rose headpiece and white veil, accompanied by her beautiful bouquet of pink roses, whilst her proud Groom leans in for a little smooch as they both share this moment of wedding day bliss. One thing’s for sure, this invitation isn’t short of love and romance! If you’re looking for a cute and cuddly stationary suite that includes Save the Date and Thank You cards as well as order of service cards and table plans (plus lots more!) 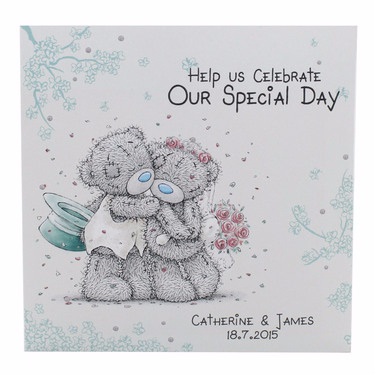 to match your Tatty Teddy wedding invitation, you’ve come to the right place!